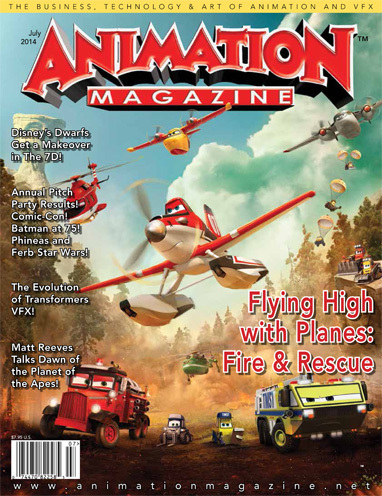 Burning Brightly - DisneyToon Studios does its homework to make Planes: Fire & Rescue a theatrical release worthy of real-life firefighters' courage. Animation with a Mission - Filmmaker and activist Kelly Gallagher combines her love of art and passion for social justice in her collage animation Pen Up the Pigs. Little Stars, Big Voices - An all-star cast of the top voice talent in the industry comes together to bring a modern, comic spin to Snow White's diminuative pals for Disney Junior's The 7D. A Whole New Dawn - Director Matt Reeves talks about putting the focus on Andy Serkis' Caesar for Dawn of the Planet of the Apes. The Results Are In! - See which projects landed atop our esteemed judges' list of the best pitches in this year's batch. Plus: Online voting results and the Animation Magazine staff's picks! Planes: Fire & Rescue, Pen Up the Pigs, The Deep, Steven Universe, The 7D, Phineas and Ferb: Star Wars, Dawn of the Planet of the Apes, Pitch Party 2014 and much more!